IF you’re in London at the moment why not head over to Leicester Square where you will come face-to-face with the real Batmobile from BATMAN v SUPERMAN: DAWN OF JUSTICE. It’s only going to be there between Friday 19th to Sunday 21st February. 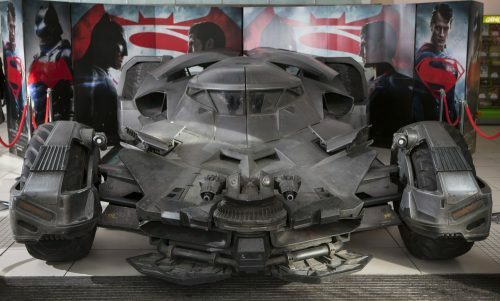 Measuring 21ft long by 11ft wide and boasting a 50mm Twin Rotating front cannon, the 3500kg Batmobile will be an awesome presence, with both cinemagoers and passersby getting the opportunity to take photographs thanks to the Odeon’s glass-fronted lobby. Fighting into UK cinemas March 25, 2016.